The new PT-E800T industrial tube and label printer enables electricians, distribution board builders, site engineers, server installation technicians and cable installers to mark their projects easily and effectively. The robust PT-E800T prints up to 36mm wide TZe laminated labels; up to 17,7mm heat shrink tube; as well as direct to tube up to 6mm high, all from one compact labelling machine. With fast print speeds of tube printing at 40mm per second and labels at 60mm per second, the PT-E800T allows print jobs to be completed quicker and even easier with the optional rechargeable battery and base for on-site use. It can be transported to where electrical work is in progress and controlled with a laptop. 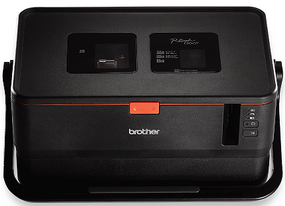 Print via a USB connection with the Brother P-touch Editor software for label printing and the Brother Cable Label Tool software for tube printing. Brother is the first company to introduce industrial tube printers with integrated twin engines. This innovation allows electricians to switch between the tube and label print modes without the need to remove or reinsert consumables before printing. Compatible with durable TZe tapes, the toughest laminated labels in the market, the PT-E800T accepts labels of up to 36mm in width, supporting a wider range of labelling applications. Ensure the legibility of your text with the benefit of additional printable height, the PT-E800T further maximises printing options with the ability to print up to 32mm on 36mm labels, and up to 6mm on tubes. With the PT-E800T, electricians can replace selected components themselves, eliminating the need to rely on a distant service center for replacement. Tube cutters, cleaners and conveyance rollers can be replaced on-site in a few easy steps. The PT-E800T includes a free, automatic 3-year carry-in warranty against manufacturer defects.